Good news continues to come from the University of Illinois Press: Michael D. Doubler's book Dixie Dewdrop: the Uncle Dave Macon story is scheduled to appear in September 2018 in the Press's 'Music in American Life' series. This should be a significant publication, and not just because of the importance of Uncle Dave as a subject. The author is his great-grandson; is a scholar and historian by profession; and (though Macon died sixty-six years ago) has been able to interview people who knew him, as well as using many primary sources and assessing the numerous stories about him. More details, including an interview with the author and a YouTube video of Uncle Dave's 'Sail away ladies', are given by Richard Thompson on Bluegrass Today. 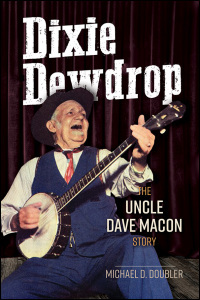 Dixie Dewdrop: the Uncle Dave Macon story will have 288 pages, thirty-six black & white photos, and two charts, and will appear in paperback at $19.95. Views of a Gibson banjo made for Uncle Dave in 1940 are on pp 162-3 of Bob Carlin's Banjo: an illustrated history (2016).